Since childhood, Steve has been drawing faces and capturing likenesses. He began selling pencil and pastel portraits at age 16. 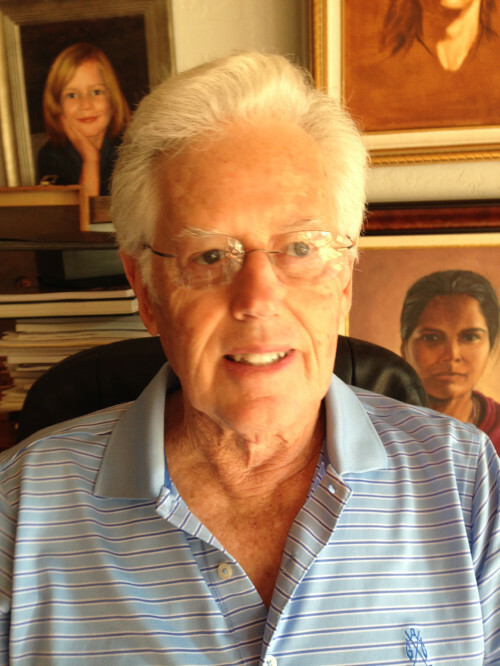 In 1964, Steve took private lessons to learn to use oils and began to accept commissions. One of his early paintings of Walter Alston, LA Dodger Manager, hung at Dodger Stadium for many years. Another painting of Jim Ryun, the Miler, hung at Ryun’s high school in Wichita, Kansas. From 1970 to 2000, Steve was totally involved raising a family and running his water treatment business. In 2001, Steve resumed his training at Art Center, College of Design in Pasadena. By 2003, he was accepting commissions for portraits and landscapes. One of his commissions, of Audrey Skirball Kenis and her husband, Charles, hangs at the Geffen Playhouse in Westwood. Steve has completed several projects for the internationally celebrated orthopedic surgeon and author, Dr. Lawrence Dorr and his “Operation Walk”. He has also completed projects for the renowned heart surgeon, Dr. Vaughn Starnes at Keck Medical Center. A few of the above mentioned portraits and other paintings are included on his website-Steve Winterbottom.com or La Canada Paintings. My main artistic interest has always been drawing and painting faces. It started with copying Lil Abner cartoons, to pencil drawing of movie stars and, of course, Elvis Presley, to impress the girls. In college, it was pastels of the Kennedys and my Fraternity Brother’s girlfriends. When I returned to La Canada, I learned to use oils from a local artist and have worked exclusively in oil ever since. At some point I realized that I had been blessed with the ability to capture accurate likenesses and expressions in the eyes and faces of both humans and animals. Feeling a responsibility to develop and use this gift, I took a variety of Fine Art classes at the Art Center College of Design, 2001 through 2010. I continue to be a fan of the Dutch Masters and try to represent my subjects in a realistic manner. While my main interest remains portraiture, I have been accepting commissions for a variety of figurative and landscape projects as well. Artwork © Steve Winterbottom. All rights reserved.